Shire Shuttle Bus will get you to the airport on time, every time. Whether it’s a domestic or international flight, you can rely on us to get you there safely. Cruises in Sydney depart from either the International Passenger Terminal at Circular Quay or White Bay. Relax into your holiday and let us get you there on time. Enjoy a relaxing day with some friends and family at some of Sydney, Shoalhaven’s Coast and Southern Highlands most beautiful wineries. To find out more make an enquiry today. Enjoy a day out to Rosehill, Royal Randwick or Kembla Grange. Relax and let Shire Shuttle Bus take care of your race day transport. Moving large groups of people on important days is our speciality. 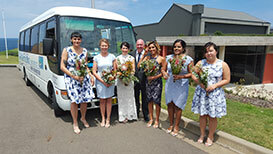 Let Shire Shuttle Bus take care of all your wedding day transport needs. We will get you safely to and from festivals, concerts or other ticketed events. Book with us and arrived relaxed and enjoy the party. Whether your flying domestically or on an international flight Shire Shuttle Bus will get you there in comfort and on time. We offer a door-to-door solution, picking you up from home and dropping you directly to the Qantas, Domestic or International terminal. So whether your travelling for business or pleasure we will provide you a prompt, reliable and effortless service. 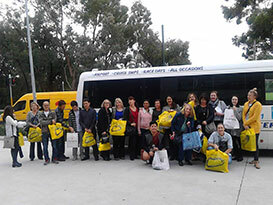 We provide transport options in the Sutherland Shire, St George, Campbelltown, Appin and Wollongong areas. Our transport solutions cater for a wide range of functions including weddings, parties, dinners or nights out in the city. Our business is getting you to the destination on time, every time. Passengers comfort and safety is is our highest priority and all of our shuttle buses are perfectly maintained. We are a family business based out of Cronulla and operate in the Sutherland Shire, St George, Campbelltown area, Appin and Wollongong. Our reliable door-to-door service will get you to your destination on time, every time. We can provide transport to and from the Sutherland Shire in comfort and safety at any time of day. Contact us and experience our fantastic service today.